These are the normally first Sunday in the month. Its been a while since writing on this page, but weeding and planting has continued over the past year. 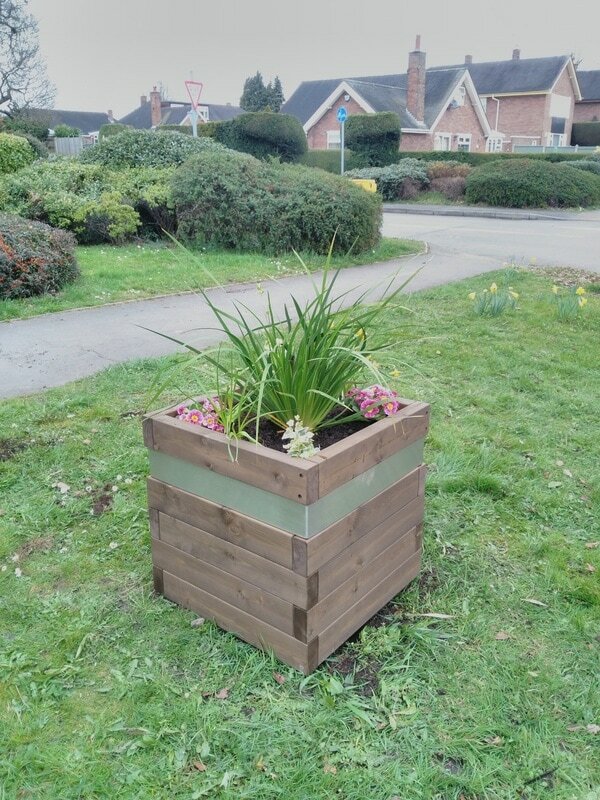 We have installed several new planters and last Sunday we installed two more and moved five old planters to near Marford Park on the wide stretch of pavement. Sue, Barbara, Marion and Sue met up to determine a plan for replacing poor tubs and emptying and replanting others. 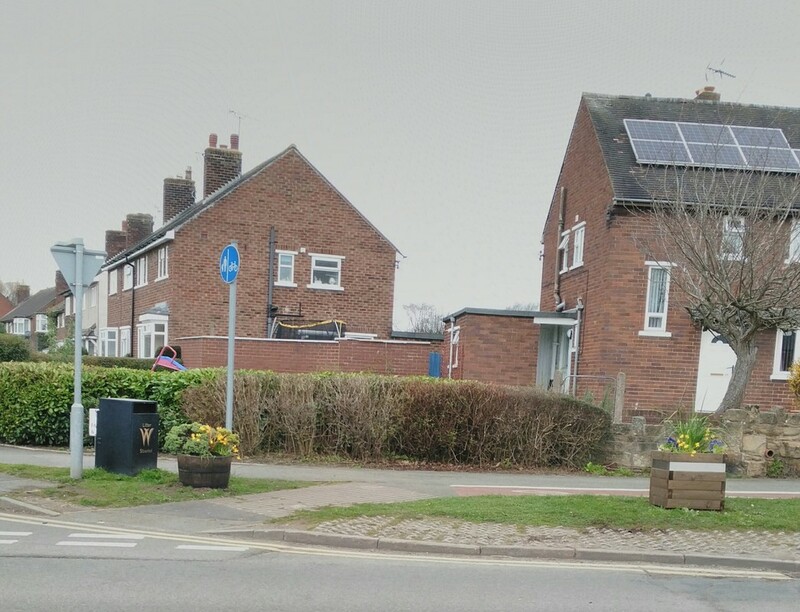 We now have a plan for the future improvement of planting on Chester Road and will be applying to the Community Council for financial assistance. One of the Photinia is being attacked by little green caterpillars so action was needed! ​Tidied up Burton Rise bed. Noted the need for work on beds by Annefield. Tidying up the tubs today and cutting out dead plants. ( the two Sues) Weeding along the wall parallel to the tubs ( Andrew.) Later in the week Barbara and Sue planted some geraniums in the pots. Barbara and Phil and Sue and Phil turned out today. We replaced the dead tree in the other large planter and weeded and watered all new planters. We emptied and replanted the tub at the bottom of School Hill and reinstated one at the top ( previously stolen ), with one that used to be on the main road. We planted up both tubs with salvaged plants. We need some more colour in the four new tubs on Chester Road. Ones by the notice board are looking well. Phil Watson also removed some of the dead weeds from the bottom of the church wall. Richard Williams had sprayed them with weed killer previously. He also volunteered to keep the 4 tubs on School Hill watered. Many thanks Richard! IMAGE members got a lot done today! Andrew and Phil replaced the broken tree with a Photinia bush in one of the large planters. 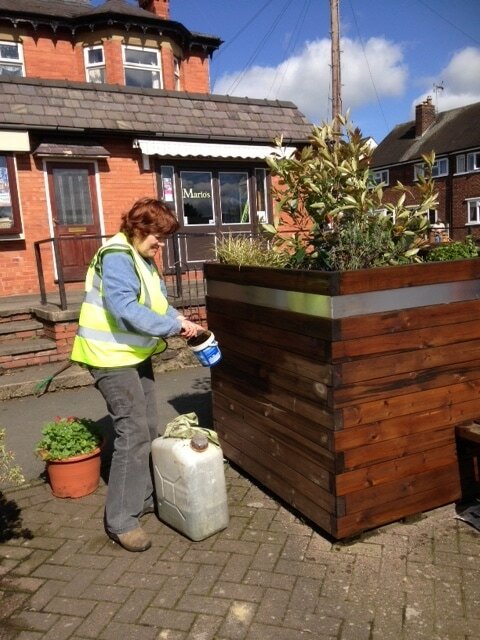 Barbara and Sue C. tidied the planters and added some new plants and painted the planters with preservative. Andrew also did lots of weeding in the area. IMAGE members turned out on Sunday to install 4 new planters on the roadside in Gresford. Phil Edwards, Sue Cleaver, Andrew Bailey, Sue and Mike Alsworth and Peter Moroney all gave their time and muscle to making this possible. This was quite an operation which involved riddling top soil, mixing it with compost. Moving heavy tubs around, emptying old ones and replanting the new ones. None of this would have been possible without Phil Edward's lorry and sack truck. Phil also donated the recycled top soil. So many thanks Phil! The wooden planters, compost and plants were purchased with money raised from the Scarecrow Trail last year plus residue from the Community Council grant given to IMAGE to install the tubs and benches by the notice board. IMAGE fund raising is on-going and is targeted on replacing all the barrel planters in time. We really need your help. Either to join us on our Tidy-Up Sundays or to tackle the areas outside your own homes – just by weeding the area where your boundary line meet the pavement, or maybe a few yards either side, you can help make a real difference. We know that no-one used to have to do it, but let’s face it in the current financial climate the Council are not going to be tackling weeds (although they are being good about taking the rubbish bags away when we have filled them up). IMAGE wishes to thank Mark Huxley of PROSERVE , Wrexham Industrial Estate, for the donation of Hi-Viz jackets and protective gloves. Thanks Mark, much appreciated! The first big effort of the new year! Mark Postle, a local gardener, donated 10 unwanted flowering cherry trees to the village. Andrew and Phil planted these in Allington Park and around the lake. Great job! Hope they flourish as they had been kept in water for a couple of months before we could plant them. 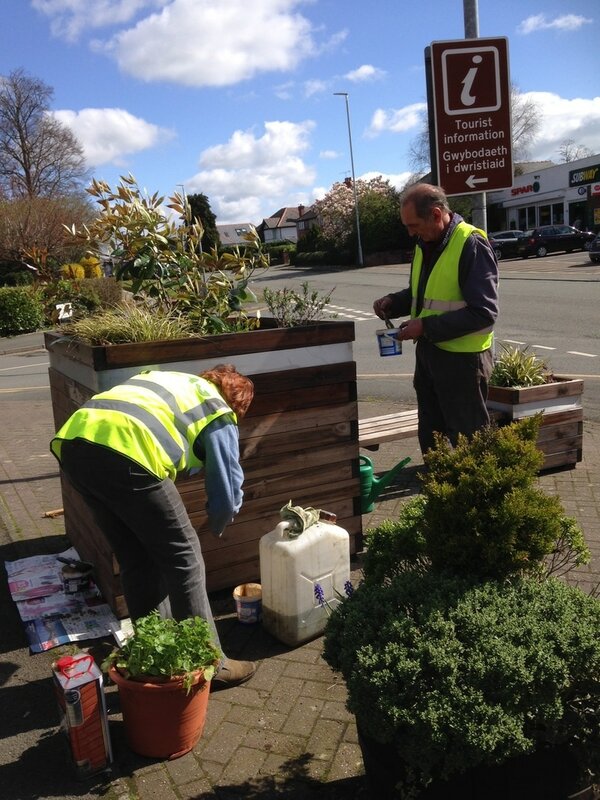 ​Meanwhile Sue C and Barbara and Sue and Mike A were busy coating all the flower tubs with preservative. They look a lot smarter now. Last ,but not least, early bird Jan Jones,collected 6 bags of leaves , twigs and other debris from the 'circle' off Newtown. When she walks through to the Library now, she feels very rewarded! Many thanks Jan.
Phil and Sue tidied up the tree pots and around the notice boards. Also cut back lots of brambles and other growth in the Shrubberies at Annefield Park and inspected all the tubs on Chester Road. 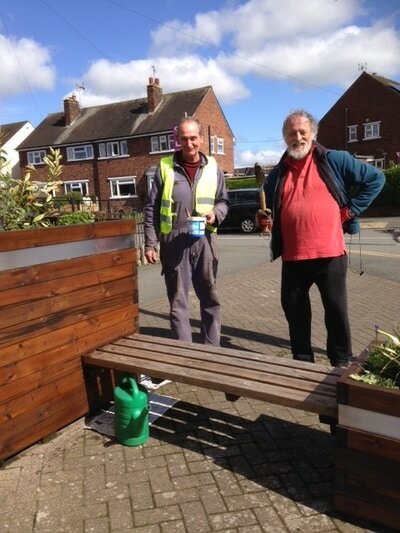 Andrew, Phil and Sue turned up to water and weed the planters and the tubs on Chester Road. Also tidied up the Burton Rise flower bed. Barb and Sue watered the new planters and weeded the tubs and Burton Rise flower bed. Phil transported stones from Sarah of 'Serendipity' to the lake for reinforcing the lake side edge. He was helped by Marion and other 'Friends of the Lake'. Thank to Sarah and Barry for their generous donation. Later in the week Barb and Sue oiled the two new benches; one by the lake, the other by the cemetery lane. Barb, Phil and Sue turned up today. Phil decommissioned the broken tub at the top of Pant Olwen then went on to weed against the wall on Chester road near the Narrow Lane bus stop. Barb and Sue dead- headed the daffodils, tidied tubs and weeded the Burton Rise flower bed. After several months of inactivity, IMAGE volunteers were back in action Sunday 6th March. ​The weather was ideal and we all enjoyed a couple of hours doing something useful for the village. Gresford Brownies also helped by picking up 4 bags of litter from the Marford Play area! Big thank you girls! The fountain had a really good tidy-up and a lot of weeding was done around the shops and in front of the Plough. 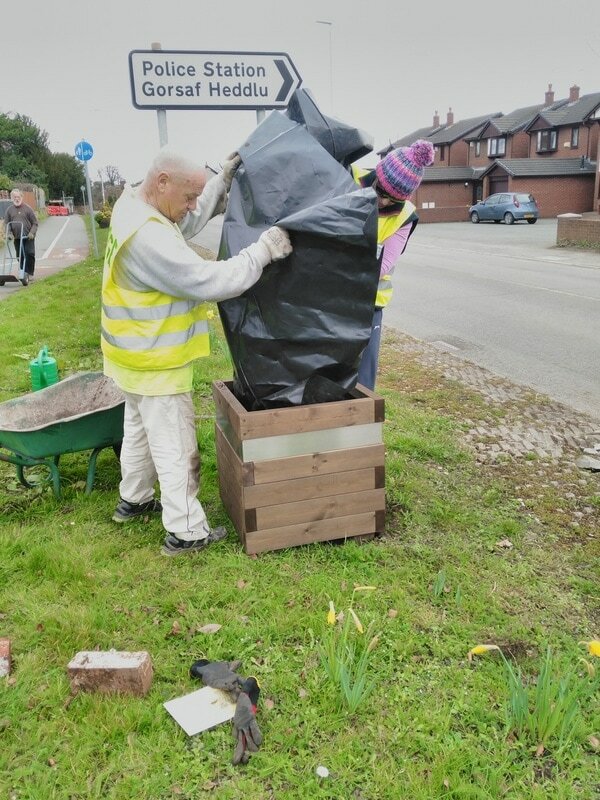 A team of 3 inspected the tubs and tidied up along the Chester Road up to Annefield Close. Marion and her helper (DoE) were busy tidying the plants around the lake. 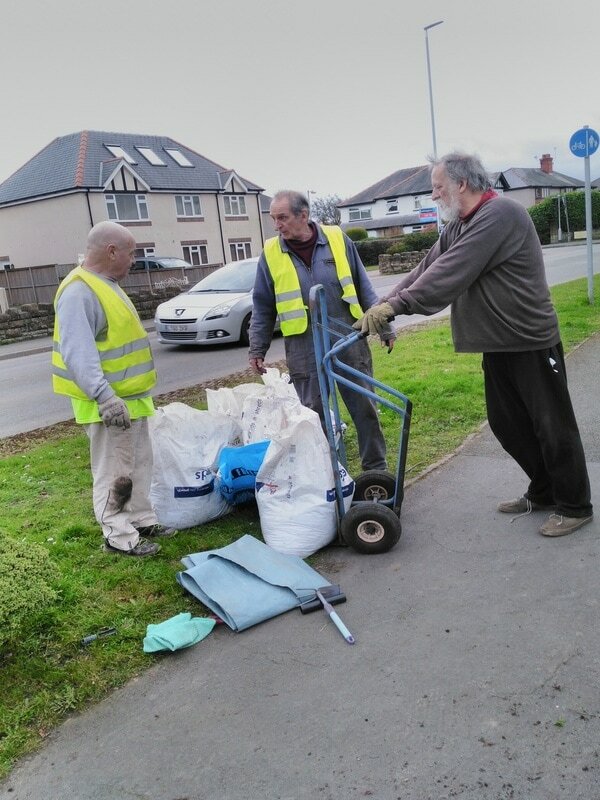 Shane Hughes from Keep Wales Tidy also turned out to help. See photos in the Gallery. tidies up the grass around the base of the cherry trees on Burton Rise. Also weeded the flower bed there. This was instead of the first Sunday in May which was rained off. We planted Nasturtium seeds in all the tubs.... Marion's brainwave. Cheap and easy way to get some colour in the tubs this Summer. 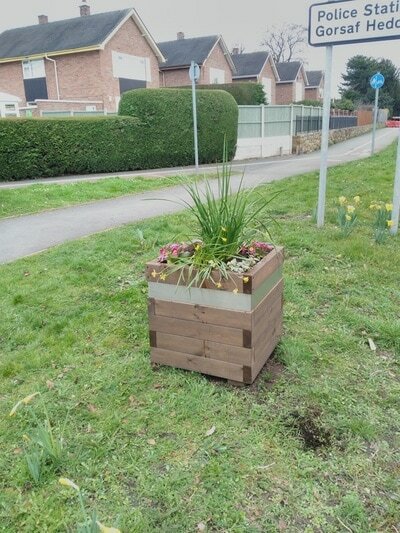 We tidied the flower bed on Burton Rise. We decommissioned 2 rotting tubs on Pant Lane and made good the one left. Two good plants from these tubs will be shortly planted by the lake. April 2015 - Poor turnout this month- just Phil and Sue. Missing Barb who is in Australia. It was fine but very windy. What did we do? Spot weed - killed dandelions in the Burton Rise bed. March 2015 - The first Tidy Up since last year. Fortunately it stayed dry for us. What did we do? Swept around the fountain and removed debris and soil from the top of the wall. Weeded around various electricity fixtures. Shovelled up mud lying near the notice board in Gresford. Replanted the barrier basket by Greens 'n Things. Added more bark chippings to the bed at Burton Rise and planted Heather and Primroses. All done by 3 of us in less than 2 hours! Photos in gallery. 7th December 2014 - Yet again the good weather was with us. We had an excellent turn-out of 8 volunteers and this is what we did. Brushed around the fountain and washed the bin there. Litter - picked all over the place! For the first time, included the passages leading to Newtown and Marford recreation park. Swept up thick, wet leaves on Chester Road footpaths. Pruned and weeded the bed at Burton Rise. We are making a difference because we care. We like to live in a tidy attractive environment. Let's keep this up ! 12 October 2014 - Another glorious morning- we are so lucky with the weather! This time we litter-picked at Allington Park- not much there this time. We then moved on to the herbaceous flower beds at the bottom of Pant Olwen/ Chester Road. Only 4 of us this time. We managed to create several bags of green waste though! Thanks to Phil Edwards for the disposing of them. In addition we filled Richard's Council green bin. Richard lives on the corner by one of the beds and very kindly brought out drinks for us. Thanks Richard! Thanks also to Karen of K2 Hair, who has watered the tubs by the Post Office all through the summer... so valuable. July 6th 2014 - Another beautiful morning for the 'Tidy Up' and a lot was achieved. The shrub beds at either side of the entrance to Allington Park and by the Post Office were pruned and stripped of rampant-growing weeds. We weeded around the shops, along the wall up to the Narrow lane bus stop, around the bus stop and the one by Alf Jones'. Additionally we weeded and tidied up the flower bed on Burton Rise and now all the tubs have had two coats of preservative. I hope that you take time out to appreciate the improvement! But please anyone can feel free so some weeding and to water the tubs and flower beds at any time! This is not just for IMAGE to do. The Tidy Up Sundays are planned to continue once a month. There will be one 7th September which will concentrate on the Lake area. Look out for posters. Councillor Andrew Bailey, Barbara and Phil Watson, Marion Williams, Emlyn Jones, Phil Edwards, Jan Jones and Sue Cleaver. 29th June 2014 -The first Tidy Up Sunday went really well. 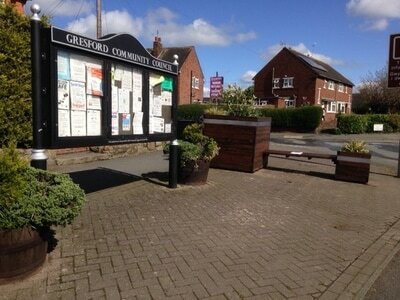 We removed weeds from around the Post Office and the Community Council notice board. Weeded all along the boundary wall and painted the tubs as far as Annefield Park. Also collected litter from Allington Park. Surprising what can be achieved in a couple of hours. Will be there again next Sunday- come and join us please!